This is a concept in development, so I’m going to open this post up to comments. Global cities are like that famous quip on obscenity: we know one when we see it. But the definitions of global cities are incredibly varied and there doesn’t seem to be a consensus or well-defined way to think about. I looked at the criteria used in various prominent studies back in 2012 and found them highly divergent. Only the Sassen based one appeared to have a robust definition and theoretical basis, but it’s a pretty narrow definition. While it’s very important and useful, I don’t think it fully captures what the average person or urbanist thinks of on the topic. In wrestling with the global city idea while working on the global city study I did some research for, I put together this framework to help organize our thinking. This framework seeks to capture in a structured manner all the ways people talk about global cities that I’m aware of. There are three basic categories of criteria people use in defining global cities: economic function, non-economic function, and size. Some, like Sassen, define global cities by economic function. In her case, just being a financial center isn’t enough. You need to be producing financial services products specifically related to the global economy, not just making mortgages domestically. I list “Financial and Producer Services Center” as a shorthand for this. In all of these definitions, when I say a “center” I’m referring to a center of global or regional (e.g., European or Latin American) significance, not simply a domestic center. If I have a contribution to the global city definition genre, it’s my contention that places like the Bay Area (tech) or Paris (fashion and luxury) that are important global or regional epicenters of an important 21st century macroindustry are also global cities in a powerful sense by virtue of that. The idea of being a transport hub for goods or services is self-explanatory, though I’ll note that simply being a goods distribution hub (such as a global air freight hub like Memphis) doesn’t necessarily imply a high value, high wage economy. Lastly, and perhaps this is one I made some contributions to as well, is the idea of a “safe zone” for investing or parking capital. Much of the world is volatile economically and only has a dubious attachment to the rule of law and property rights. Hence wealthy people in those countries like to stash their cash in places where they consider it safe. Where I would distinguish this from a simple offshore account as in the Caymans is that this investment often includes real estate, and the rich folks in question often establish a personal base there. New York and London as the paradigmatic global cities obviously fall into this category, but I’m more thinking of regional hubs like Dubai, Miami, and Singapore. These places have established themselves as premier business (and in some cases cultural) hubs for their regions. These are other aspects of a city’s function that I see as not directly economic, though obviously there are economic impacts. Most of these perhaps could be subsumed under being in an industry epicenter, but since global city surveys often call them out separately, I will as well. The first item is being an important global political capital like Washington, Moscow or Beijing. Enough said. Another important dimension is being a cultural and media center. Los Angeles profoundly affects the world because of its entertainment machine and the media that goes along with it. (By contrast, Mumbai may be a huge film center, but serves largely a domestic and Indian ethnic audience). Obviously the English language cities have a big advantage here in terms of media, though cities like Paris have a powerful cultural role. Lastly, being a global tourism center is another dimension. Which places draw foreign visitors? You might want to read Nicole Gelinas’ recent taken on international tourism’s affect on New York. NYC attracts a third of all foreign visitors to the United States. Lastly, many surveys include measures that are purely about size, such as total GDP. The rhetoric about megacities (those with more than 10 million people) shows a fascination with size as well. Beyond the categories that define what global cities are, I include a horizontal layer talking about how to think about whether they are successful. I think there’s a big debate that can be had about whether these are performance indicators or selection criteria. Obviously more global city surveys want to pick highly performing cities, so these are part of their evaluation matrix. I myself originally included diversity and educational attainment (talent hub) on the non-economic function list. I won’t go through these as they are pretty self-explanatory. I’d be interested to see where you all would put these, and what you’d add to or drop from the list. By the way, in that global city survey I worked on, we decided to look purely at economic function, though pulling across media hub and treating that as an industry. We felt that taking this sort of view was a gap in the existing inventory of ratings, and also perhaps the most important way to think about global cities. Again, comments are open on this one, so please share your thoughts. I am a huge fan, Mr. Renn. I appreciate your proposed synthesis of criteria for global cities. I think it captures a lot of what is talked about in my little corner of the world — an epicenter for urbanism and regional development. However I’m concerned with the lack of mention of socioeconomic diversity and what role that plays into the character of a global city. Each of the cities mentioned here have wealth disparities that are alarming, concerning rates of unemployment and underemployment, and in our case, a well-established social services safety for people who fall on hard times. These folks also contribute to the economic viability of a global city (whether in a positive manner or a negative manner). In this corner of the world CBOs, NGOs, and NPOs bring a sizeable chunk of money into our economy just through services to the no-low-moderate income population. I feel like these dollars get overlooked quite a bit when they contribute a large portion of real estate investment, financial service consumption, economic development investments, and helps to spur the microentrepeneurial culture people love here. Are we a global city? I think we’re becoming one — but we’re starting to face the consequences of becoming one — skyrocketing rent prices and property values, subsequent property taxes, and a lag in liveable income. All of which are also markers in all the global cities mentioned in this article. I will submit that while the discussion of what constitutes a global city is interesting, there is only one city in the world — as I write — that matters, and that is Washington, D.C. The future of the world is being debated and decided right there. Tonight, tomorrow and into the foreseeable future. The City of London and its affiliates may be the Western world’s CEO but Washington is the Western worlds COO. The U.S. is the chief enforcer of Western economic policy. How that is enforced is decided in our nation’s capital. No other city in the world today exerts that kind of influence. Cities like Moscow and Beijing are in fact on the defensive, and that is extremely worrisome. Please don’t take my word for this — do your own research. I love this idea Arenn but i think a major problem is as you point out what exactly is a global city? 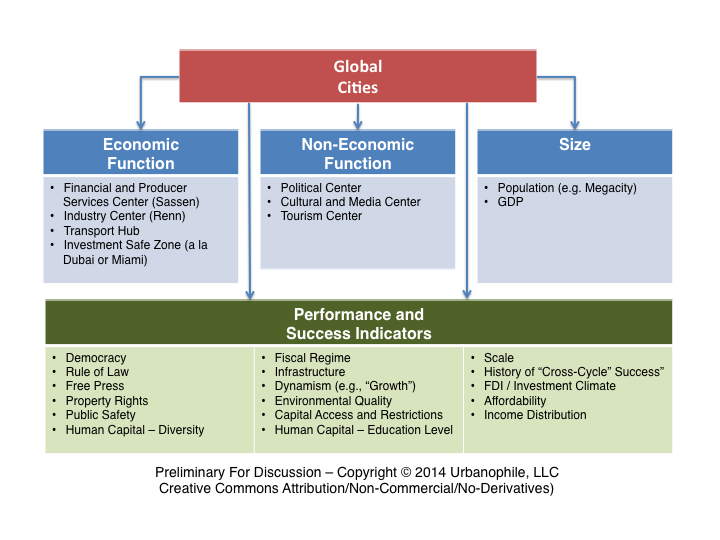 what makes a city global and not global? What is the line to cross to become global? The problem with defining a global city is the geographic unit of analysis. Large swaths of universally accepted global cities (e.g. New York) are not global at all. Small pockets of universally accepted non-global cities (e.g. Buffalo) are, indeed, global. I suggest neighborhood as a more useful geographic unit of analysis. How to define a global neighborhood? I use the lens of labor markets, distinguishing between regional and global. Global labor toils in tradable, divergent industries. Regional labor toils in either non-tradable industries or tradable, convergent industries (e.g. manufacturing). Regardless, global cities or neighborhoods are defined by the migration of talent. You’re not considering universities or research expenditures. Is that an oversight, or do you think these aren’t as relevant as financial, political, and cultural functions? Clearly Singapore, Beijing, Hong Kong, and Moscow aren’t entirely democratic in the Western sense of the word, but just as clearly we would probably agree that they are global cities. I would extend somewhat on Jim Russell’s remarks: vehicle (and vehicle parts) manufacturing is a key world industry, and obviously Detroit is a key node in control of that industry. It is also a very busy international border/trade city, as well as a key international air hub. Yet almost no one would consider Detroit a “global city”. Where to draw the line on “industry centers” will be important. Likewise, Washington DC isn’t a “megacity” by population or economic output or industry. But as Ziggy points out, it merits consideration as a global city for one reason only: it is the seat of the US government. And so it actually is an “industry center”…of politics, policy, and government. Oops – my comment notified apparently got turned off and I didn’t get these sent to me. Sorry I didn’t weigh in sooner. Really appreciate the feedback. This is sort of a discussion document so glad to hear your take.